Looking for an incredible 6-in-1 LED PAR can that comes packed with a ton of bells and whistles, but won’t cost you an arm and a leg? Look no further than the LB PAR™ Hex! 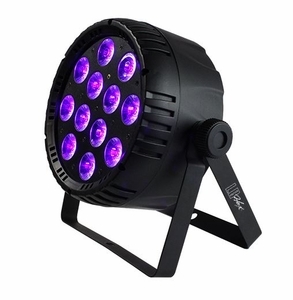 With 12x totally bright 15-watt RGBAW+UV 6-in-1 LEDs, LB PAR™ Hex fixtures give you the ability to create any rich, vibrant color you can possibly imagine, then you can even add ultraviolet light to the mix to give it an eerie hue. Maybe create a custom scene with some beautiful, slow color fades leading into full on UV, alternating with a few brilliant blasts of cool white strobe. The possibilities are endless with 6-in-1 RGBAW+UV LEDs, they are truly amazing! All the features one can hope for are loaded into the LB PAR™ Hex including 12 incredible built-in programs with auto mode, sound active mode, strobe effects, 8-bit or 3 user selectable 32-bit dimming curve options. It can perform full RGBAW+UV color mixing with 6/11-channels of DMX, or simply be controlled via its easy-to-use 4-button LED control panel. The LB PAR™ Hex comes with equipped with PowerCON™ compatible AC in/out and DMX in/out jacks, and is a light weight, yet very solidly built unit with durable scratch resistant composite housing, and dual mounting brackets for flexible positioning. And as course, LB PAR™ Hex fixtures are backed by Blizzard’s 2-year warranty!